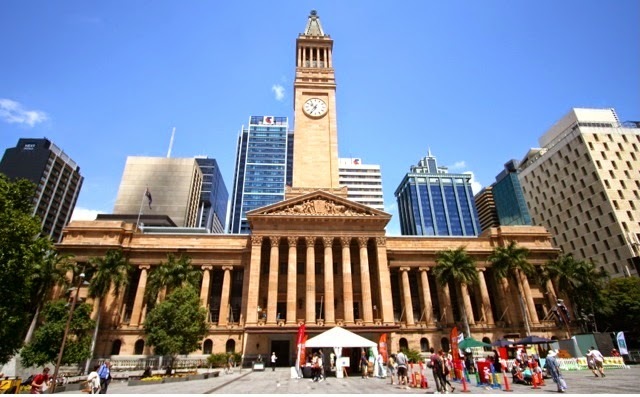 On the weekend of 11 and 12 October Brisbane hosted its annual Open House. We went last year, kind of by accident, and thoroughly enjoyed ourselves. This year we were really looking forward to it - especially to visiting St Mary's at Kangaroo Point and The Polo Club in the City - as this was where we were married almost exactly 10 years prior. But it was also due to this anniversary that Guy and I wound up missing the Open House and going to Melbourne to celebrate instead. I gave our VIP passes and guide books to our dear friends Nat and Pablo and their daughters to enjoy instead. Below is Nat's very entertaining report about their day out in the city. Being a relative ‘newbie’ to Brisbane, having only lived here for a couple of years and originating from Scotland, it was with great pleasure that my family and I accepted Bree’s offer of the Brisbane Open House 2014 passes. I had never heard of it before but jumped at the opportunity to find out a bit more about the beautiful city that we are now so lucky to call home. First stop was the St Andrew’s Uniting Church on the corner of Creek and Ann Street. It was far from the large blocked, coursed granite churches that I was used to, coming from the North of Scotland. 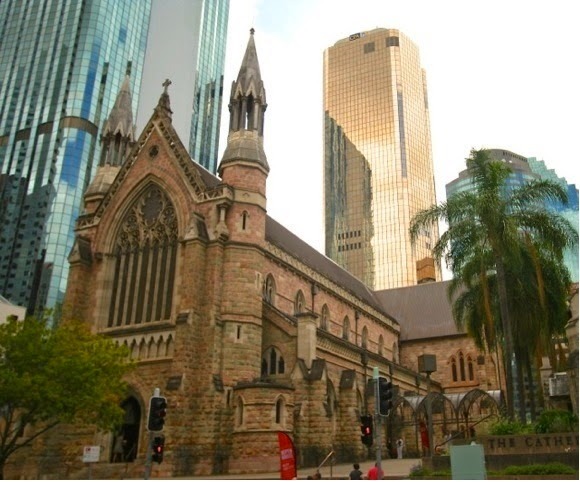 Instead, a tall, elegant and inviting, red bricked church nestled amongst the skyscrapers beckoned us into it’s striking interior. Our guide informed us that it was said to be one of the best examples of neo-Romanesque style in the southern hemisphere today and I wasn’t going to argue with that. The arched timber roof and red bricks where reminiscent of a medieval banqueting hall, even the kids were speechless, and believe me that doesn’t happen often! My daughter was particularly taken by the stain glass windows and stood in a trance trying to work out all the images. 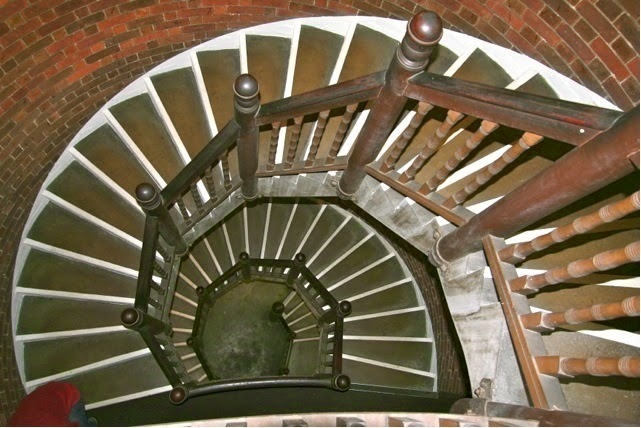 However, for me, the secret spiral staircase at the back of the church was just remarkable. 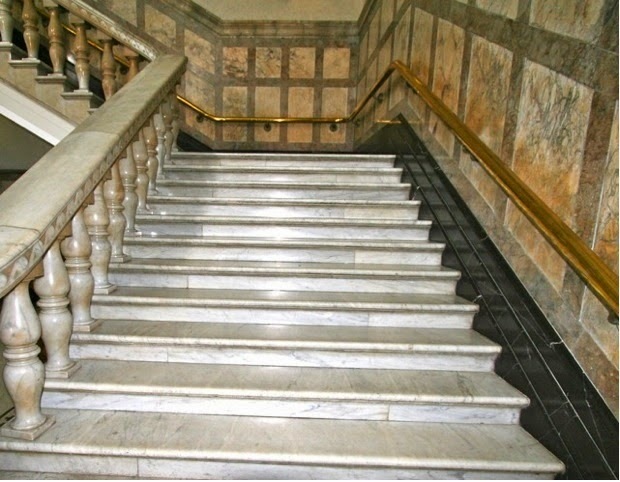 As we were climbing the staircase to the very top, my daughter announced that she felt like a Princess in a castle, I had to agree that I did too. It was just magical. We left the church with a revived feeling of excitement for what other treasures and secrets we were going to uncover on this fine Brisbane morning. Next stop was St Stephen’s Cathedral. In stark contrast to St Andrew’s Uniting Church, the imposing stairs at the front of the building make it difficult to get to with a stroller and its imposing high towered Gothic revival style façade is overwhelming. On closer inspection however, the interior is spectacular. Unfortunately, we were unable to take any photos of the inside as the mass was about to start but take it from us, it was truly stunning inside. Right next to the larger St Stephen’s Cathedral is a little sandstone chapel which is very quaint. 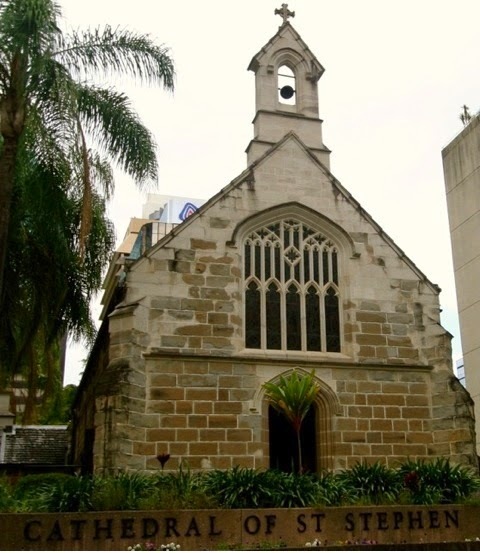 It was built around 1850 and is the oldest church in Queensland. 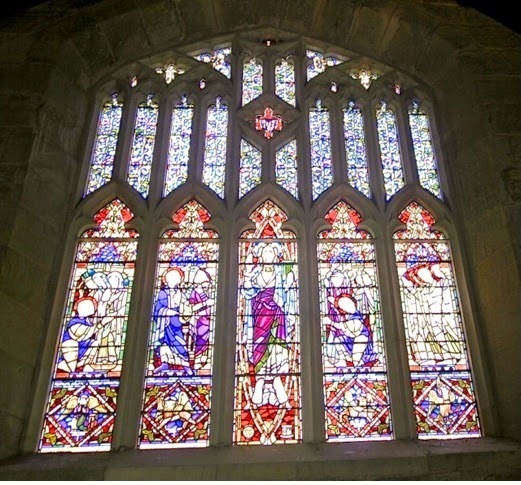 It has been restored inside and has a peaceful and intimate air about it. It hosts the camphor statue of Mary Mckillop, Australia’s only saint. What a beautiful treasure. By this point, my little companions were starting to grumble so, we took a swift detour to the Queen Street Mall for a quick refreshment and then into the Brisbane Arcade. Tucked away from the hustle and bustle is the oldest arcade in the city. 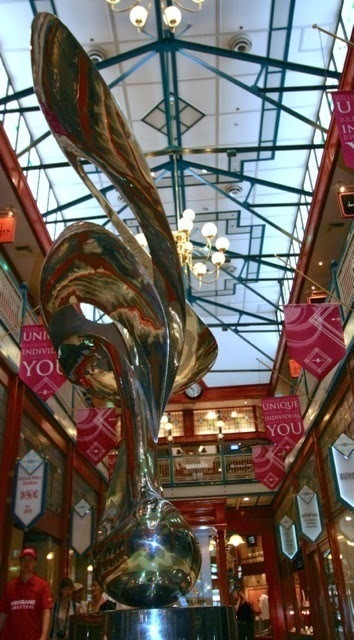 It was built in 1923 and is now home to Mirage, a piece of public art. My daughter was very impressed with this hidden gem and was convinced it was a silver dolphin. I enjoyed the way the light reflected and glittered off it’s surface. The sculptor, Gidon Graetz, from Switzerland, was commissioned to produce the work for the World Expo in 1988. 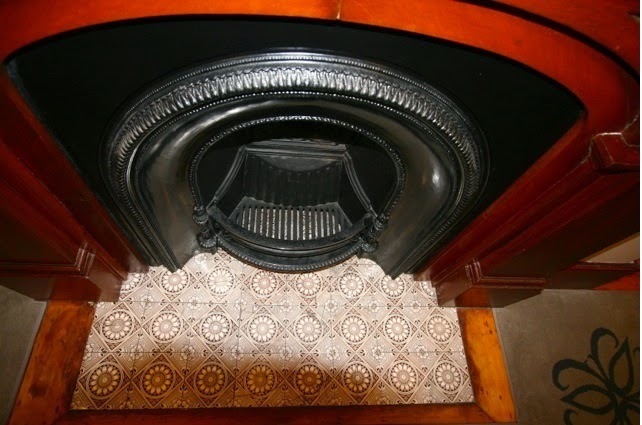 It was then bought by the Mayne Family Trust and the Brisbane City Council and housed in the arcade. It is well worth a closer inspection. 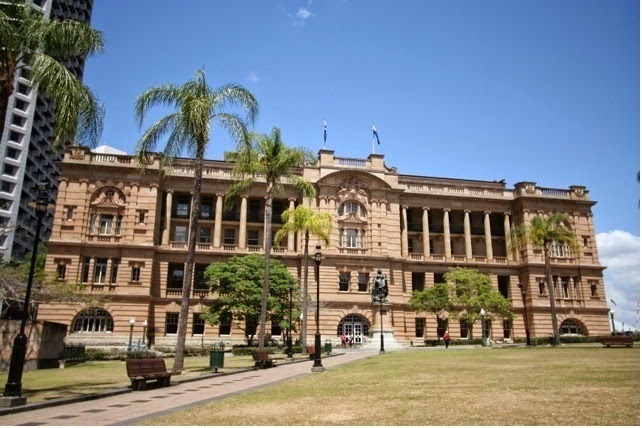 Just around the corner, is City Hall, known to the local community as the ‘People’s Place’, I am slightly embarrassed to admit, that despite having lived in Brisbane for 2 years, I have never set foot in this majestic building. 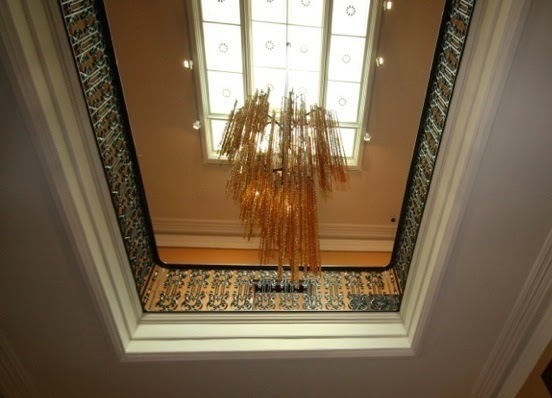 We were particularly impressed with the beautiful ceilings and sweeping staircases. What a wonderful example of a classical revival civic building. Next stop, The Treasury Casino and Hotel. From the outside, it is a beautiful example of an Edwardian Baroque building but I was a little disappointed with the worn out feeling of the building inside. It wasn’t until we ventured into the internal courtyard that we found an absolute gem of a place to hang out. Overlooked by the rooms of the hotel, the courtyard has a distinct French feel about it. 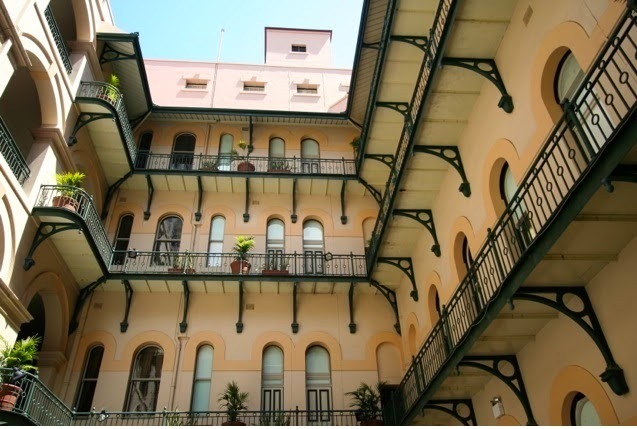 The rooms located around the central courtyard open out onto shared balconies. We were informed that this was to maximize natural light and ventilation in each of the rooms. It is a fabulous design. I was very tempted to sit for a while, sipping on a glass of French wine, taking in the serenity, and imagining that we were in Paris…..But we had the kids in tow, so we decided it would be easier to plough on to our next destination! Last stop was Old Government House, and to say I was overjoyed to see a courtyard coffee shop attached to the austere looking building is an understatement. I think the rest of the family were all pretty relieved too. This is evidently what got us through the door and moving swiftly through Government House. We have to thank my daughter for the picture of the chandelier and fireplace. She managed to commandeer the camera at this late stage in our mission and was clicking away enthusiastically. What a great building. 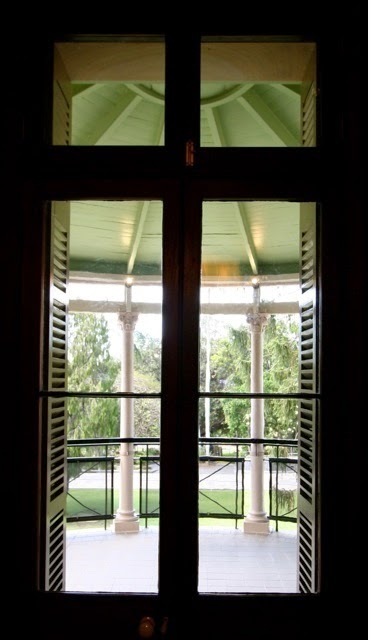 I was interested to learn that this House is unique as the only purpose –built Government House in Queensland. 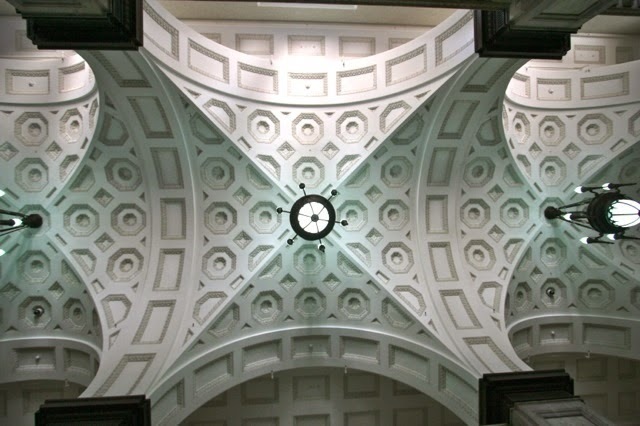 It displays Classical Revival architecture which has been modified for a tropical climate. I love the way the wide balconies sweep all the way around the outside of the building. The wide, gleaming staircase of the main hall was extremely impressive and you could definitely imagine the large society functions that must have taken place here. Finally, it was time to reflect on our busy day over coffee, milkshake and a rather large lamington. 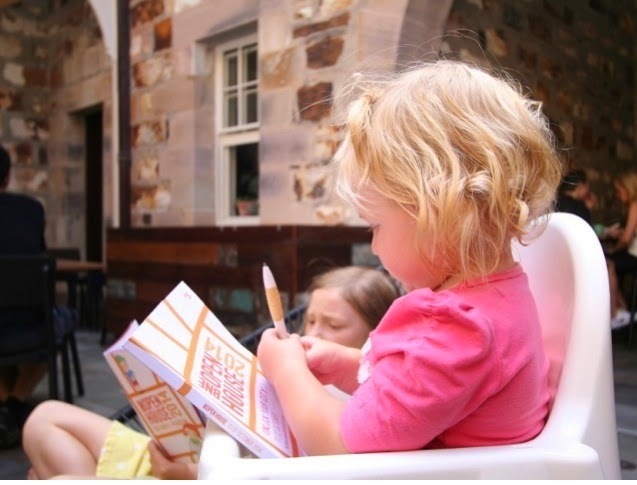 It is safe to say that the whole family had a wonderful day exploring some of the Brisbane Open Homes 2014. Here’s to unlocking the city even further next year!